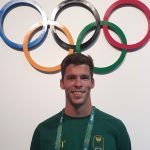 That growth came in the form of several national championships and top-three finishes in international competition, including a bronze medal in the 2008 Beijing Olympics. 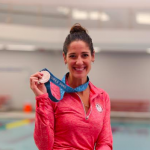 In addition to using her own story to reinforce her motto “Never stop believing,” Kim is able to impart knowledge on her swimmers from a wide array of resources, drawing from a mosaic of training techniques she has encountered in her 27 years of swimming. Kim is not afraid to reveal these “secrets” to young swimmers, packaging them in an innovative, encouraging, and fun environment to boot. Not only will swimmers find themselves learning new, creative drills tailored to their specific stroke needs, but they’ll also understand the value of positive thought patterns and intrinsic reflection. Pushing past “self-limiting” beliefs is a topic on which Kim is an expert, an action she believes to be critical in growing as a person and athlete. Fostering a healthy and competitive racing approach is crucial for success. Does your swimmer struggle in the meet environment? Kim remembers feeling “most focused and alive” in competition, and she yearns to cultivate this same eagerness in young swimmers. With an emphasis on body and head position, Kim will help athletes develop a natural feel for the water while reinforcing good practice habits. With this newfound “feel” and comfort, she hopes to instill a sense of confidence in her swimmers that will translate to race day. the sport and its future generations of athletes. Become a true student of the sport, and learn from one of the best in the field! Sign up for Kim’s next clinic today!